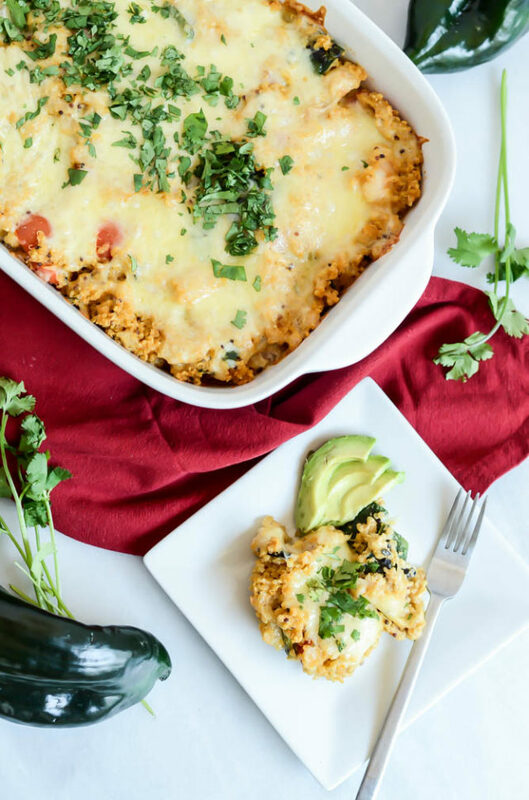 Who’s ready for a delicious, healthy one-pan dinner?? While we’re still working on the whole me not having to cook a thing part, the hubs has been great at at least helping out with dinner prep for the last few weeks. He’s a master at the grill, so we’ve been making most of our protein that way and then supplementing with either an easy salad or some sort of veggie. 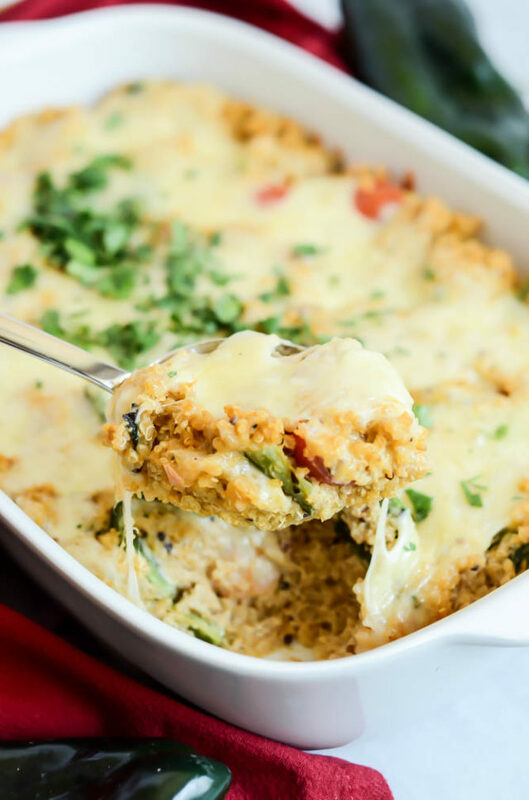 But every once in a while we crave something just a little fancier, and this quinoa bake is just the answer! I can’t remember how it came to me, but a few weeks ago I suddenly got the urge to make some sort of Mexican-themed dish pairing shrimp and poblano peppers. I thought about it for a while, and wavered between making ACTUAL enchiladas, nachos or tacos. But then I thought about how NOT to complicate my life and instead make something that was (a) healthy and that (b) I could easily throw together and just pop in the oven. 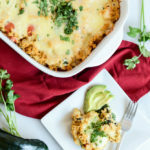 With the extra pop of protein it provides, a quinoa bake seemed like the perfect way to get the flavor combinations I was craving while also having a filling, delicious meal on hand in the refrigerator to heat up at a moment’s notice. After that, it’s just a matter of tossing all the ingredients together in a bowl, transferring them to a baking dish, topping with some cheese and popping the whole thing in the oven! 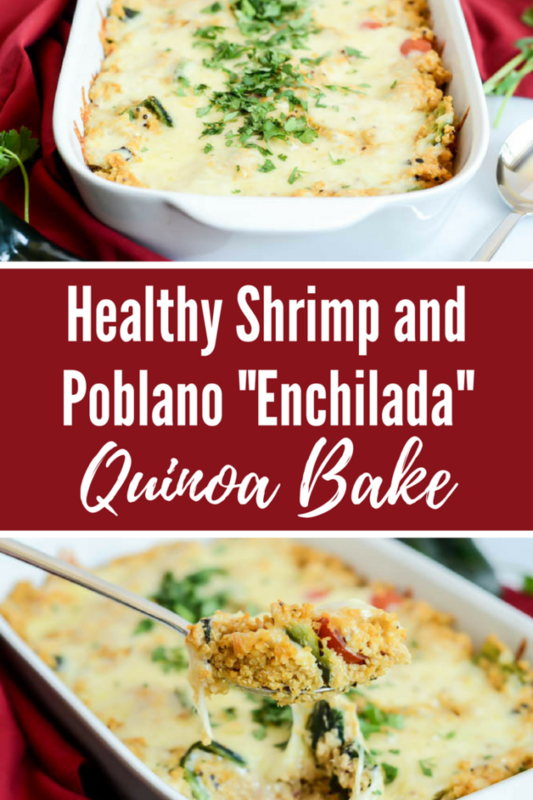 The greatest thing about this Healthy Shrimp and Poblano “Enchilada” Quinoa Bake? It’s ready to devour in just 15 minutes!! Now that’s the perfect dinner if I ever saw one. And, although the hubs and I EASILY polished off at least half of the bake in one sitting, I also love the fact that it reheats beautifully, which means this preggo mama can have a delicious, healthy, protein-packed meal or snack at a moment’s notice. A healthier take on enchiladas featuring fresh shrimp and poblano peppers, a cashew cream sauce, cheese topping and plenty of flavor! Soak cashews in water overnight at least one night before you plan to make the quinoa bake. The next morning, drain the cashews and add them to a blender with the rest of the cashew cream ingredients. Puree until a smooth cream forms and set aside. You can also prepare the quinoa one day (or more) in advance of making the dish. Simply add the quinoa and vegetable stock to a medium saucepan, bring to a boil, reduce and cook for 10-15 minutes, or until all of the liquid has been absorbed by the quinoa. Once you have the cashew cream and quinoa prepped, the rest of the meal will come together in a flash. Using a gas grill or stovetop, hold each pepper with a pair of metal tongs and place over a medium flame until the skin is nicely charred. Remove from heat and destem and chop into bite-size pieces once cool enough to touch. Set aside. In a small bowl, mix together the cumin, chili powder, garlic powder, cayenne, paprika, ¼ teaspoon salt and dash of pepper. Preheat the oven to 400 degrees Fahrenheit and get out a 3-quart baking dish. In a large mixing bowl, toss the shrimp with the prepared seasoning blend, then add the cooked quinoa, charred peppers, garlic, onion and tomatoes. Finally, add the entire batch of cashew cream you prepared in advance. Stir to combine. 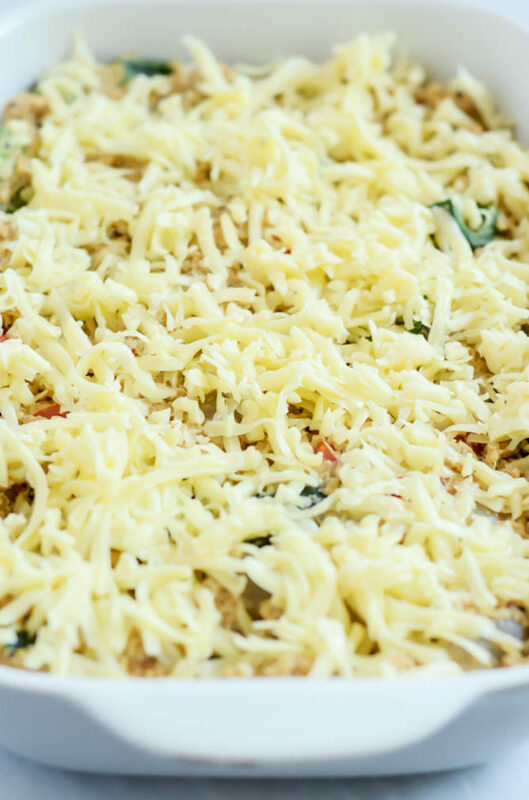 Transfer quinoa mixture to the 3-quart baking dish and top with shredded Jack cheese. Place in oven and bake for 15 minutes. Garnish with fresh cilantro and sliced avocado and enjoy! We’re starting to get real creative with the healthy stuff over here. 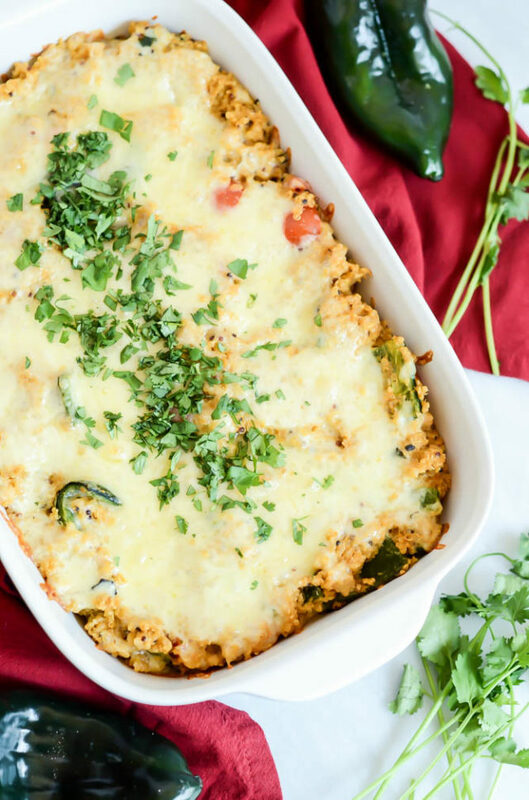 Like, I can’t believe I would ever create this Spicy Stuffed Pasilla Pepper recipe without even thinking about needing to add any cheese. Who am I? I’m a gal that’s open to trying new things and willing to give anything a shot as long as I don’t have to cut anything else out of my diet completely, that’s who I am! No, I’m not a vegetarian and no, I’m not gluten or dairy-free, but I’m up for trying anything as long as it’s made from whole, minimally processed foods. This is truly one of the things I love most about the healthy diet and lifestyle I’ve created for myself. Try everything, restrict nothing. I find that this relaxed view of whatever food I consume has been the savior in the long road to “eating recovery” I’ve taken since my college years. It hurts me to watch people struggle with binge-eating or not being able to control themselves in the presence of unhealthy food , simply because they tell themselves they absolutely CANNOT have something. By allowing myself to eat anything I want, but being in tune with how hungry I am and how my body feels after I eat certain things, I can truly say I’ve become an “intuitive eater.” I eat something if it sounds good, but knowing that I can always have more later keeps me from going off the deep end and eating too much and feeling weighed down and uncomfortable. That being said, I find cooking things outside of my norm a great challenge, and I find that when I do so, I often discover new recipes and flavors that I never would have thought of before. 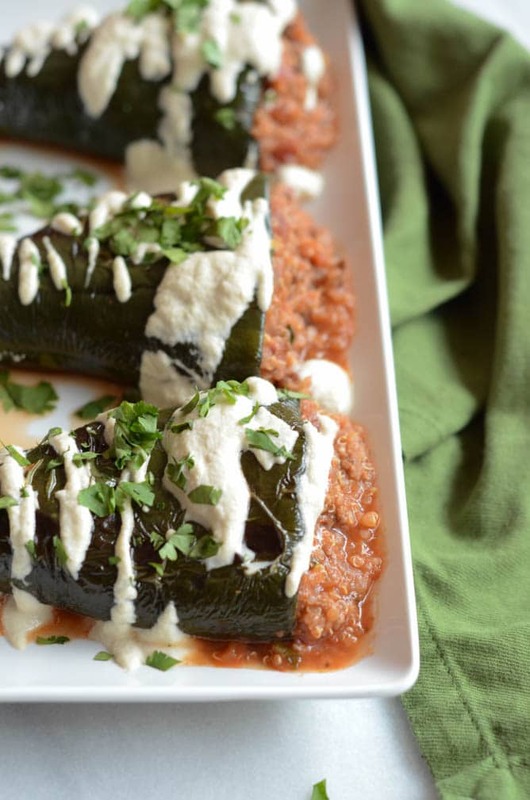 Which brings me back to these delightful Spicy Stuffed Pasilla Peppers with Cashew Cream Sauce. Yes, cashew cream sauce! You guys, this may be one of my new favorite secret weapons. I know, I know, it’s nothing new (folks have been talking about it for ages) but what I’m saying is, this is the first time I took a step out of my comfort zone and gave it a shot and, boy, am I glad that I did! During the summer, I try my hardest to use as much of the abundant fresh produce available as possible in my cooking. There’s just nothing like preparing a healthy, satisfying dish with ingredients just recently pulled from the ground or picked from a tree. 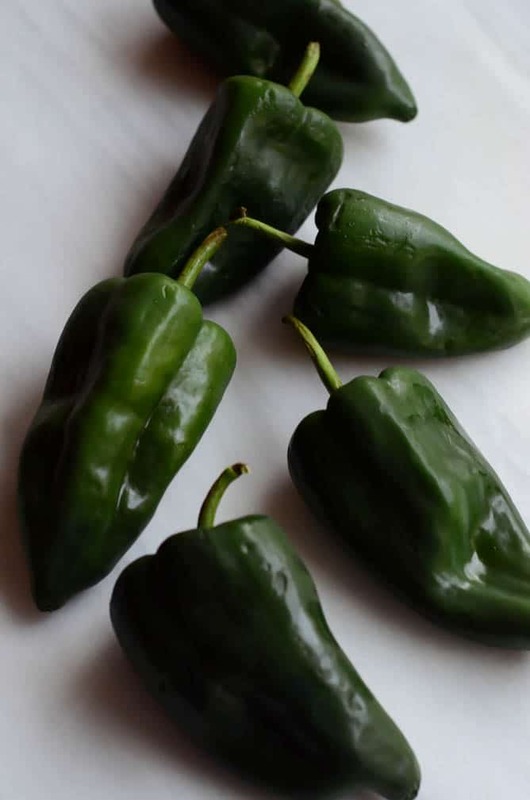 One of my favorite vegetables to cook with during the summer is fresh pasilla peppers. They have just the right amount of spice and roast (or grill) up beautifully. They’re also the perfect size to stuff with all kinds of delicious, healthy fillings. 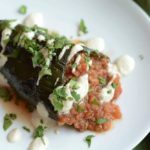 Enter this delicious recipe I’ve created for Spicy Stuffed Pasilla Peppers with Cashew Cream Sauce. One of my favorite ways to stuff pasilla peppers is with a ground meat and tomato sauce combination. Tomatoes are a natural complimentary flavor to peppers, and the ground meat adds some substance. Although you could use any type of ground meat here, I opted for ground bison as it is a bit leaner than beef and usually more humanely farmed. I also added quinoa to thicken up the filling a bit and include even more protein to keep us full and satisfied. 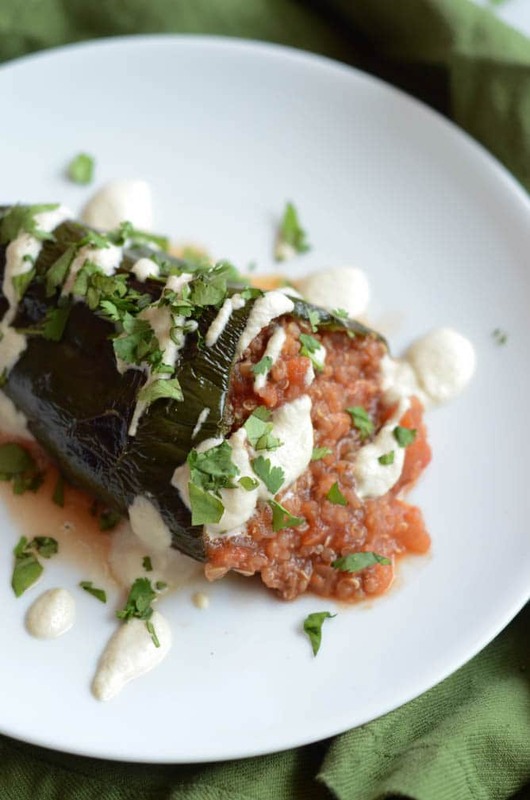 We all know that Chris and I have been really focusing on filling our bodies with whole, nourishing foods in these last couple of weeks leading up to the wedding, and this whole Stuffed Pasilla Peppers with Cashew Cream Sauce idea was borne from that mission. I don’t know about you, but I always LOVE adding cheese to any recipe that contains peppers and tomatoes. In an effort to cut down our cheese intake but still have some sort of creamy factor to the peppers, I decided to try my hand at the above-mentioned cashew cream sauce. Score! 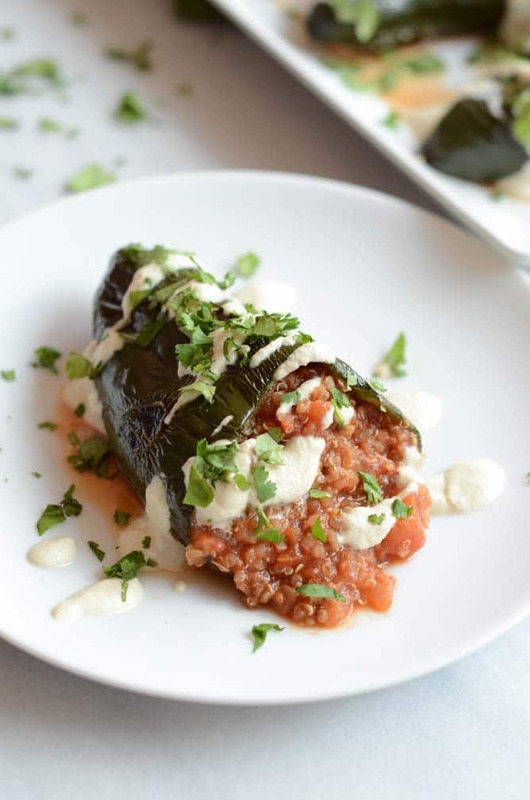 Not only are these Spicy Stuffed Pasilla Peppers incredibly tasty, they are also very easy to make. Since we don’t need to worry about melting cheese over top of the peppers, we actually roast the hollowed out peppers on their own and cook the filling on the stove. The cashew cream doesn’t require any cooking and can be made up to three days in advance. I’ve recently started making this vegan condiment and find it’s the perfect healthy addition to many recipes, so you’ll want to keep a good stockpile in your refrigerator for use at any moment’s notice. Just be sure to heat up the amount you’ll be using on your peppers a bit before using to bring it up to the same temperature as the rest of the dish. 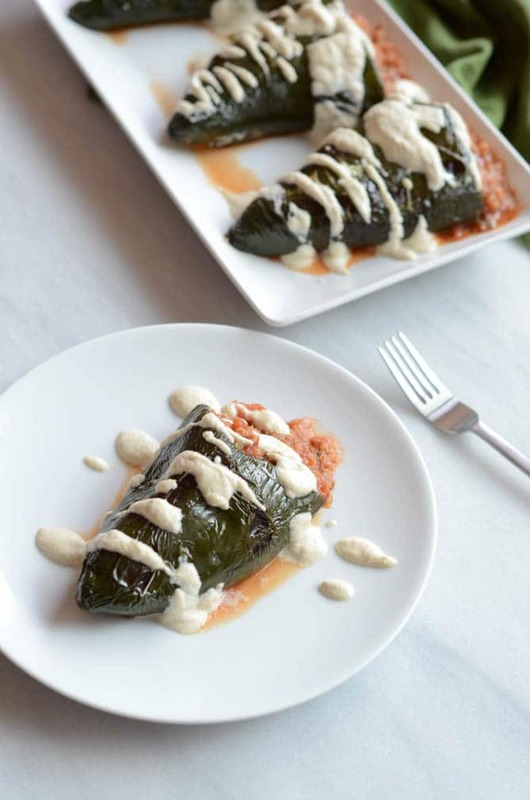 When served with a mixed green salad, these Spicy Stuffed Pasilla Peppers with Cashew Cream Sauce are the perfect weeknight meal. They come together quickly and won’t leave you feeling heavy or weighed down. They’re the perfect addition to your weekly menu rotation. So now my only question is, what are you waiting for?? 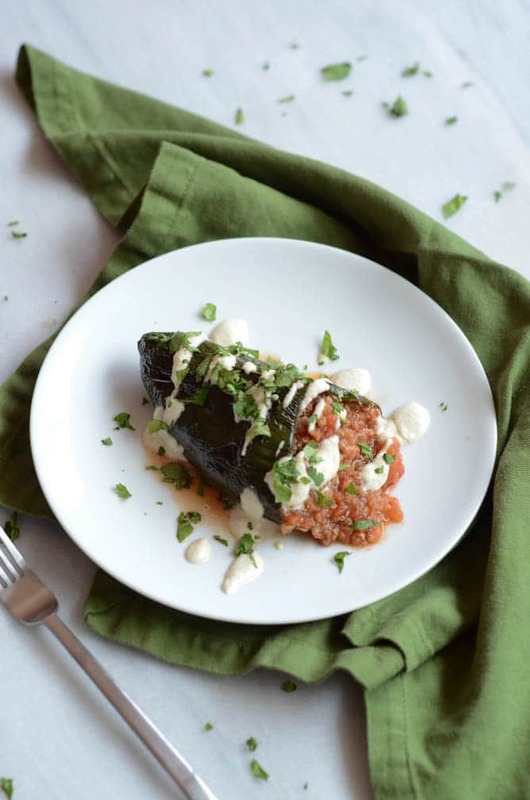 A healthy dinner recipe featuring roasted pasilla peppers stuffed with a delicious combination of tomatoes, quinoa and ground bison, all topped with a luscious cashew cream sauce. Preheat oven to 400 degrees Fahrenheit. Place peppers on a jelly roll pan lined with aluminum foil and brush with coconut oil (or spray with coconut oil cooking spray.) Once oven is preheated, place peppers in to roast for 25 minutes, flipping once halfway through the cooking time. Remove from oven and set aside. Heat olive oil in a large sauté pan over medium heat. Once pan is warm, add onion and garlic and sauté until onion is translucent and garlic is fragrant. Add ground bison and continue cooking until meat is lightly browned. Once meat is lightly browned, add crushed tomatoes, cilantro, cumin, cayenne and brown sugar. Stir to combine. Turn up heat to medium-high and bring to a simmer. Add cooked quinoa and season with salt and pepper as needed. Continue to simmer for 5-10 minutes to allow flavors to meld. Place cashews in a small mixing bowl. Fill bowl with water, enough to just cover the tops of the nuts. Let soak at least 4 hours or overnight. When cashews are done soaking, strain out water and rinse. Place cashews in a high-powered blender with nutritional yeast and salt. Turn blender power on low and slowly increase, streaming in filtered water consistently to get the right consistency. If needed, stop the blender and scrape down the sides every once in a while. You will want to continue running the blender until the cream is smooth and has very little (if any) chunks. 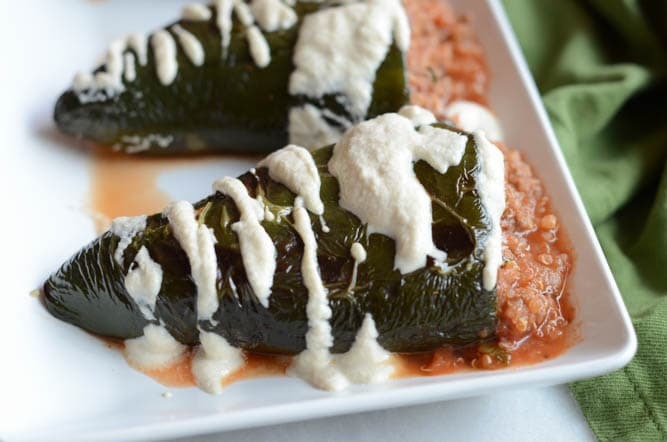 Remove cream from blender and place in an airtight container (if making ahead) or drizzle directly over stuffed peppers. Note: You will most likely have both leftover filling and cashew cream. The good news is, both of these keep and reheat well. Place in airtight containers and keep in the refrigerator for up to a week. Or this Ahi Poke Salad with Macadamia Nuts!